Located on the north coast of Fuerteventura, holidays in Corralejo are perfect for those who love the beach. Not only can you choose from the beautiful sandy coves dotted along the coastline, the sands stretch back into protected sand dunes filled with wildlife and just waiting to be explored. Families and couples alike will love the many activities and facilities dotted in and around the town. Just off the coast you’ll find some of the best surfing spots in Europe, while inside the town you can browse the many shops before stopping off for delicious dishes in the excellent restaurants. Adventurers will find plenty to keep them entertained on holidays in Corralejo, with the dunes providing secluded landscapes ideal for explorers, as well as bird watchers. Watersports can be found at Flag Beach, which is well known for its excellent surfing and kite boarding conditions – ideal for those wanting to try their hand, or simply watch the experts. For lively golden sands perfect for children head to Galera Beach, where the conditions are safe for swimming and the selection of beach bars serves up delicious drinks and cuisine throughout the day. As well as its many lively activities, Corralejo offers some fantastic opportunities to relax and enjoy a luxury holiday. Corralejo Old Town is home to narrow streets packed with family run restaurants and leading down to the pretty harbour area. Stop off in one of the tavernas and choose from some of the delicious freshly caught seafood the island is so well known for. Boutique shops are ideal if you want to pick up unique gifts and souvenirs, and there are also shopping centres full of designer and well known brands. Music Square is the perfect place to listen to live Spanish musicians and immerse yourself in the Canarian culture of the island. 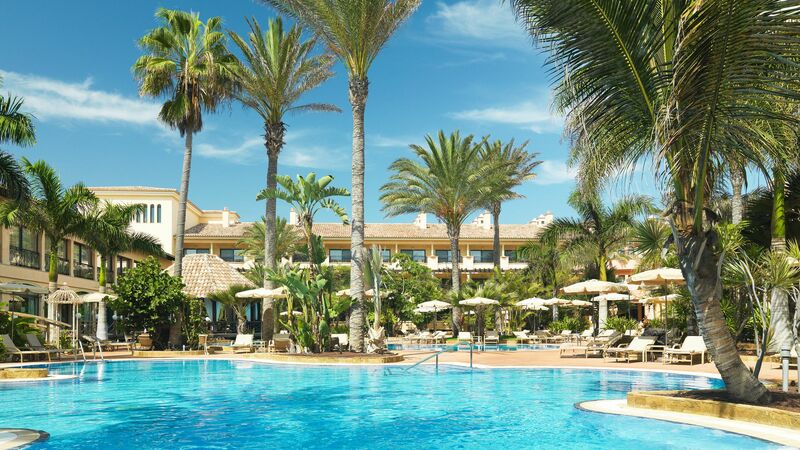 For the ultimate luxury holidays in Corralejo, book with Sovereign. Each of our hotels has been tried and tested by an expert member of the team and offers excellent facilities and amenities. Choose the Gran Hotel Atlantis Bahia Real for its wide selection of luxury activities. Michelin starred dining is offered onsite, and there is also a spa, Mini Club, and beautiful architecture and décor throughout. Take a boat trip to Los Lobos island, off the coast of Corralejo. It’s a barren island with deserted beaches which make you feel like you’re a castaway (best not to miss the boat back!). Also, make sure you get a reservation at the island’s only restaurant. Transfer time from Fuerteventura airport to Corralejo is approximately 40 minutes.